"I’m so very sorry to share that Tommie just passed away. He had just finished having his bandages changed and stopped breathing; his body simply gave out," the shelter said in a Facebook post. RICHMOND, Va. — Tommie, a male brindle pit bull that was intentionally set on fire in a Richmond park, has died, The Richmond Animal Care and Control said in a Facebook post Friday. "I’m so very sorry to share that Tommie just passed away. He had just finished having his bandages changed and stopped breathing; his body simply gave out," the shelter said in its post. "Tommie was pain-free and surrounded by people that loved him when he passed. Needless to say, we are all devastated and angry and sad and terribly disappointed." Tommie was brought to the shelter Sunday after he was found tied to a pole in Abner Clay Park off the 200 Block of W Clay Street, covered in accelerant, and intentionally set on fire. Witnesses said they saw a man, wearing multiple layers of pants, run from the scene. At the shelter, he was given the name Tommie. Click here to donate to the Richmond Animal Care and Control. 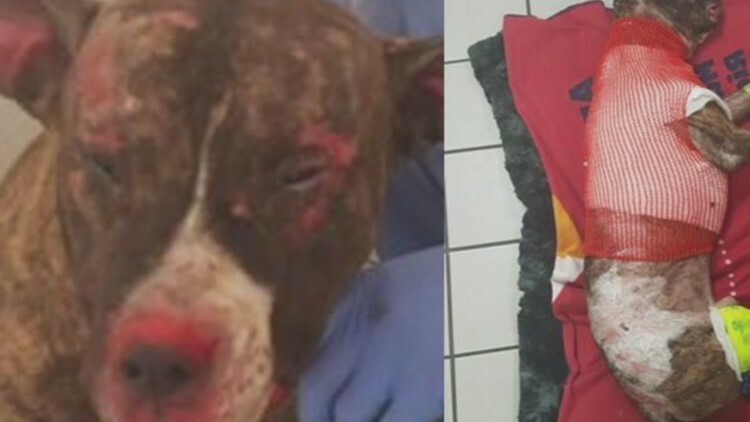 A reward fund has already collected $10,000 to arrest and convict the person(s) responsible for burning the dog. The Humane Society of the United States is also offering a reward of up to $5,000 for information leading to the identification, arrest, and conviction of the person or persons responsible. The shelter said it remains "steadfast in our dedication to find the person now responsible for Tommie’s death. The REWARD for information leading to the successful arrest and conviction of the person/s has risen to $25,000." "This increase is a result of your individual donations and is joined by pledges from our partners and friends at The Humane Society of the United States, the Cathy Kangas Foundation for Animals and the Humane Rescue Alliance." If anyone has information about this crime, they are asked to call Metro Richmond Crime Stoppers at 804-780-1000.